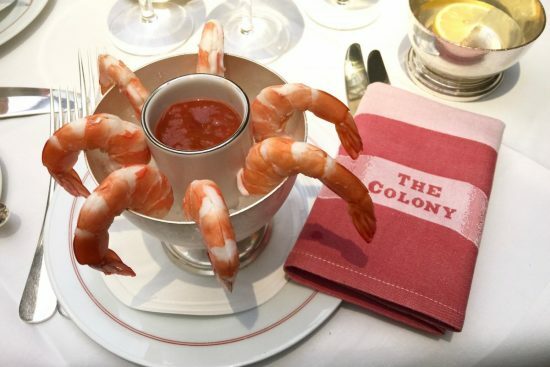 I think – and I say this tentatively because there are so many beautiful hotels and brilliant restaurants in London – but I think that The Beaumont Hotel and its restaurant, The Colony Grill Room, might just have sailed up to the top of my recommendations list. I stayed at The Beaumont (it’s in Mayfair, opposite side of Oxford Street to Selfridges) about two years ago and loved it. My room was so suave and old school posh – plush carpets, marble surfaces in the bathroom and the most impeccable finish on absolutely everything – it was a real change from the minimalist spaces that you often get at expensive London hotels. This was all smoked glass, dark wood and cleverly-placed strips of mirror – it was like inhabiting a Tom Ford movie set. Just my style, which you’ll know if you’ve seen the odd picture of the inside of my house or, indeed, remember the interior from my previous house. I returned to The Beaumont just before Christmas for lunch at The Colony Grill Room – I had breakfast there when I stayed overnight, and it was glorious, but I have always wanted to sample the proper menu. Mr AMR and I had originally booked for dinner on my birthday a month ago, but had cancelled because he was so full of cold and wouldn’t have been able to taste anything anyway! And I’m really glad we postponed – lunch at The Colony was absolutely worth waiting for. The restaurant is a “grill” – so classic sort of old American dishes like chowder and burgers and so on as well as some more European offerings – but it’s about as refined as a grill can get. It’s a grill in emperor’s clothing – the best ingredients, the sharpest service and the sort of low-lit, leather-club-chair vibe that makes you want to settle on in and never leave. The food is comforting in a classic roadside diner sort of way except that nothing from a diner would ever be this well executed. I wish I’d ordered more, as the shrimp cocktail starter didn’t even touch the sides and – y’know – research, but I didn’t want to be greedy. Rookie error. I could have easily devoured the Tuna Tartare and a Club Salad along with my burger! Anyway, this wasn’t supposed to turn into a post in its own right, it was supposed to be part of a Sunday Tittle Tattle at some point in the near future, but I’m so often disappointed when I eat out (especially at “fine dining” sorts of places, interestingly!) that it’s worth me noting when I feel truly satisfied. This isn’t somewhere you’d go for a “gastronomic experience”, it’s not one of those places that pushes boundaries and makes you question what the hell it is you’re actually eating; it’s pretty straightforward food, just done extremely well. With proper service. And eaten in a buzzy-but-slinky room that feels as though it should be packed with Hollywood film stars and infamous mobsters. I’ll be back for brunch. 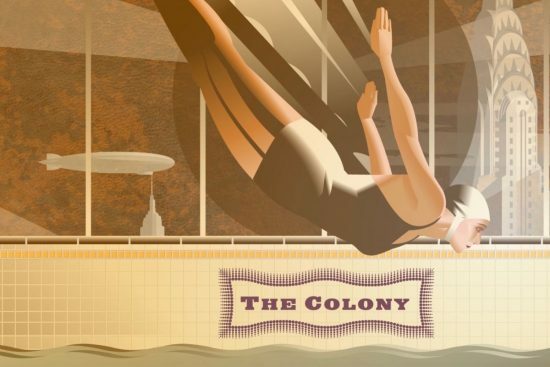 You can find The Colony Grill website here. Mr AMR informs me that lunch cost £84 for the two of us, including tip – we had two starters, two main courses and two soft drinks. It was like the Noah’s Ark of dining.